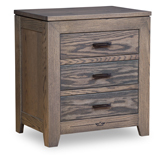 The Adrianna 3 Drawer Night Stand with Opening has molding in the base and under the round top. Above the drawers, an arch partly covers the shelf. This classic nightstand functions in the modern age. side mount drawer glides and under mount drawer glides. A secret compartment, sliding top and a 3 plug power strip option available for this unit. Pictured in brown maple wood and coffee stain burnishing. Pictured in oak with OSC-226 Coffee stain. 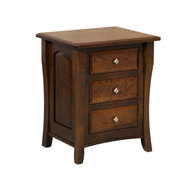 Enjoy the best features of the stylish Bear Lodge Collection with this knotty and twiggy handmade nightstand with a door. 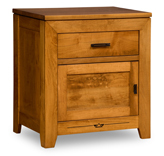 This nightstand is made to show off its handmade qualities with distinct planks, for welcoming cabin style furniture. 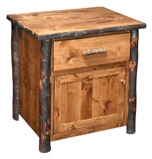 Pictured in brown maple with Antique Slate finish. 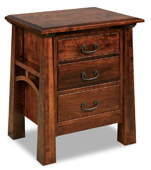 The Berkley 3 Drawer Nightstand features curved legs and arch panel sides. The beveled drawers with their diamond hardware work with the beveled edge of the top to create stylish unity.